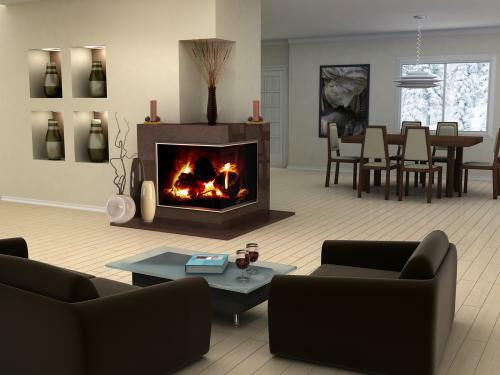 Don't think of a corner fireplace as an awkwardly placed architectural feature that challenges furniture layouts. Embrace the angle as a sophisticated design feature that brings edgy style to any room. The traditional looking electric corner fireplace surround has very classic styling with the fluted wood pilasters, molding and decorative wood appliqués applied to the face. Despite all of these traditional elements, the room still has an underlying modern feel. Does Each Wall Need a Picture Hanging on It? Update the walls with a trendy neutral such as "greige," a warm mix of beige and gray that makes a lovely backdrop against a white or ivory fireplace surround. Paint the trim, molding and the walls all the same color. Install hardwood flooring in deep tones of charcoal or ebony. Go floor to ceiling with traditional style draperies. Use double curtain rods to layer sheer panels inside of decorative valances and heavier outer curtain panels. Go with an abstract print on the valance and curtain panels instead of a traditional floral or toile print. Display photos on the mantle in a shiny chrome frame. Place a white pillar candle on a carved wooden candlestick with a gunmetal finish. Add some fluted white glass or ceramic vases to play up the classic, fluted legs on the surround. Mount an abstract or modern Art print inside of a traditional frame to display over the fireplace. 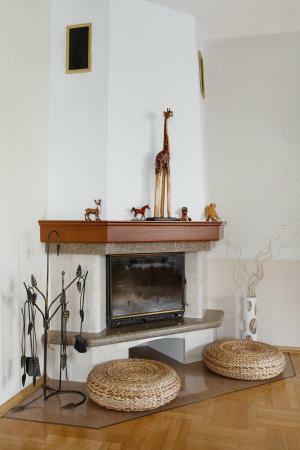 This minimalist style corner fireplace instantly draws the eye with its majestic giraffe sculpture standing front and center on the mantle. Influenced by the peaceful splendor of natural settings, it reads as a perfect spot to sit quietly with a good book or to have an intimate conversation with a trusted friend. Woven grass floor cushions introduce rich, earthy texture complemented by the natural wood grain and tones of the mantle and flooring. Twigs border the fireplace on the left in the form of a rustic iron tool stand and on the right, a bundle of twisted twigs makes an interesting accent in an unusual sponge-like vase. The sleek, smooth finishes on the natural wood and stone of this fireplace and the soft, neutral color scheme gives it a clean, contemporary look; hallmarks of minimalist style decorating aimed at conveying sophistication. For the flooring, install 12 inch square, honey oak parquet wood tiles, on the diagonal from the corner of the room. Consider adding some wood ceiling beams or, if possible, install a skylight to brighten the area with natural light and impart a feeling of being outdoors. However, be careful not to overdo it. Too much additional décor will distract and lessen the impact of the centerpiece. Keep it simple, natural and uncluttered. Include floor cushions, ottomans or an area rug made from natural grasses such as Sisal or jute. Hang a few pictures of natural landscapes on the wall nearby and offset a rustic, iron stand holding fireplace tools with a large urn or vase holding twisted twigs or dried reeds. Choose a standout centerpiece sculpture for the mantle, whether it's a giraffe, elephant, a tall crane or a horse, bear or big cat in an action pose, standing on its hind legs to help emphasize a sense of height. Fill in empty space along the mantle with smaller figurines, rocks, and natural items. 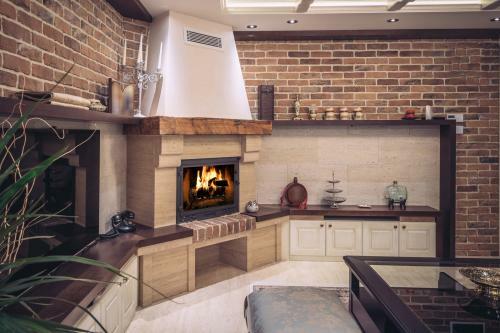 The design is more complex, yet this corner fireplace still looks warm and inviting. Built-in recessed soffit lights keep shadows at bay and help illuminate decorative accent wall features and shelf art. The exceptional lighting of this area indicates a layered approach that would include overhead pendants to brighten the entire room. The space has a distinct eclectic look with vintage objets de art casually placed on decorative shelving and built-in cabinetry surrounding the fireplace. A wonderful mix of rough and smooth textures brings visual interest to an all-neutral color palette of brown, beige and cream. Bench style seating by the coffee table offers a warmer spot by the fire. Brick wall panels help define the area with dual focal points created by the fireplace and the TV. Get this look in your home by elevating the firebox of a corner fireplace with built-in, bench style cabinetry that wraps around the corner and extends several feet on both walls. Include a wrap-around top shelf that extends outward from the fireplace mantel. Build or have a custom-built wooden mantle and surround made for the fireplace. Cover the wall between the bench cabinetry and top shelf with these Travertino ceramic tiles, which resemble stone with a wood-like grain. Above the shelf, finish off the remaining wall space with faux brick paneling made from thin slices of real brick. Install directional recessed ceiling lights or track lights to highlight the varying textures and depth created along the walls. Include ceiling fixtures for general lighting and lamps or cove lights for accent lighting. Decorate the shelving and walls around the fireplace with treasures found from thrift stores, flea markets, specialty boutiques or yard sales. Objects collected from different eras lend a look of authenticity, like keepsakes slowly acquired from travelling adventures over time. One of the best suited designs for a corner is the kiva fireplace. Also known as a beehive fireplace, this design is most commonly found in Southwestern, Adobe style homes. The fireplace is typically constructed from the same Adobe clay material used to construct the walls of the home. In the past, a kiva fireplace had to be installed by a mason, on a solid, ground level foundation to support its immense weight. Today, they can be made from prefabricated kits that contain an arched or square firebox connected to a metal chimney pipe. The traditional beehive shape surrounding these components is made from a metal mesh lath façade covered with stucco or plaster. This new lightweight design makes it possible to install a kiva fireplace in a second story room. In this example, the kiva fireplace blends in with the surrounding architecture as the material covering it is extended along the surrounding walls. It serves as a sculptural, standout architectural feature emphasized by a few primitive, museum-like art pieces. However, if you look closely, these accents don't look Southwestern at all. Although the roots of this fireplace design trace back to the Pueblo Indian tribes of the southwestern United States, there are no design rules that state you can only install one in a Southwestern style home or strictly use only Native American décor to decorate around it. Decorate the fireplace with a few select pieces of handmade art. Ceramic vases, sculptures, plates or pottery play into the earthenware design of this feature. Hand woven baskets or artifacts carved from stone or wood look right at home with a kiva's ancient design; think African or Pacific Islander for an interesting twist. A custom, hand forged iron fireplace screen adds a distinctive, rustic touch. 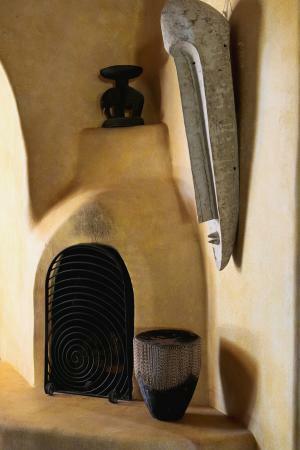 This unusual corner fireplace has an antiquated look with angular, stepped geometric lines that hint at an Art Deco influence, as does the model car sitting on top - a classic 1920s roadster. The posh furniture is also befitting of a 1920s or 1930s era parlor or sitting room designed to entertain and reflect the opulence and glamour of old Hollywood. Tangerine orange and gold were popular decorating colors during the Art Deco and Golden Hollywood eras; notice the subtle gold pattern embossed with metallic threads on the bold orange upholstery. Sleek materials such as the glass table and the gold vinyl on the bottom of the sofa and chair are also hallmarks of Art Deco style but the pattern itself reads more Hollywood Regency than Deco. The curvy, flowing lines of the floral patterned area rug are more typical of Art Nouveau, a short-lived but extravagant a style that preceded Art Deco. The ornate brass mantle clock and twin candelabras have the timeless look of interesting conversation pieces; are they priceless family heirlooms or did they once belonged to royalty? Despite their differences, these early 20th century design styles had something in common; an extravagant, upscale look. It wouldn't be uncommon to find a mixture of these style elements in a residential home, as one style evolved into the next. Consider kicking up the Art Deco vibe a notch by covering it with shiny copper Deco tiles. Hammered copper tiles would also be a good option if you prefer a slightly more rustic aesthetic. Buy the big upholstered seating furniture next - it will take a large portion of the budget. If you have reservations about a room filled with orange, go with navy blue on a velvet tufted sofa or sette lounge paired with a tangerine or burnt orange side chair. These complementary colors will create the bold contrast characteristic of Art Deco and Hollywood Regency designs. Accent the sofa with Deco inspired fan patterned pillows in ombre shades of orange. Treat the windows with sheer cascading lace inner panels underneath a waterfall style or scalloped valance with tassels and outer panels in hues of brown, rust, beige or blue. Complement these romantic textiles with a traditional style area rug in rust, blue and beige. Keep an eye out for a metal and glass coffee table with either curvy, scrolling designs (Nouveau) or sharp geometric lines (Deco), depending on what appeals to you the most. Add an antique model or toy cars and antique or vintage mantel clocks. What about a corner fireplace in the middle of the room? If you want a look that commands attention, a multi-side fireplace built-in to an outside wall corner simply can't be missed. Room dividing walls are an endangered species in today's modern open concept home designs so if you're going to add one, give it a higher purpose. This two-sided corner firebox makes a stunning accent in this great room. This wall could also be fitted with a three sided peninsula fireplace that would provide see-through visual access to the dining room as well. Customize the look of your fireplace with a sleek surround made from coffee-brown granite. Tie the art niche grouping in with the fireplace by painting the back walls of each compartment chocolate brown. Dark brown can be paired with practically any other decorating colors, including cool grays for walls, as it pairs nicely with blue, green or violet undertones. Enhance the ambience when entertaining by lighting up or turning on (flickering LED) metallic copper pillar candles on each end of the fireplace top. 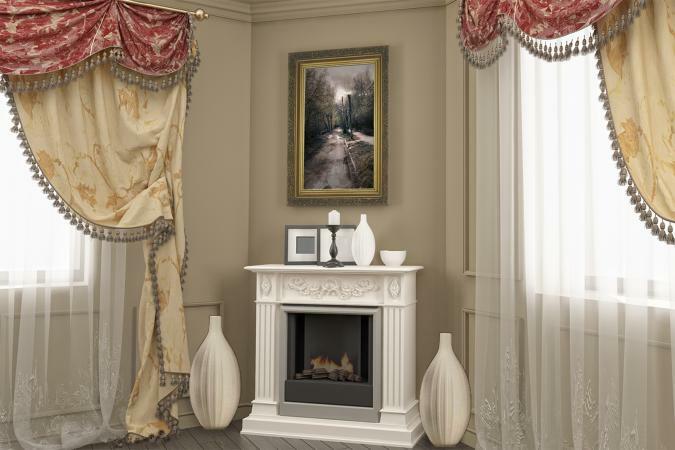 Create a contemporary ceramic art display around your modern corner fireplace. Fill the wall compartments with a group of identically sized and shaped vases with different designs. Place an odd-numbered grouping of vases on the hearth with varying shapes and sizes. Display a single vase filled with silk orchids or dried reeds as a centerpiece above the fireplace. A corner fireplace can ignite a brainstorm of clever decorating ideas that will bring an entirely new look to the room. If you go about it carefully, you can continue to update the look either occasionally or even seasonally without having to do extensive remodeling every time. Bold or bright colors can make a dramatic statement and add a lot of excitement to any decorating scheme. However, even a color you really love can wear out its welcome when trends or styles change. Add interest to all-neutral color schemes by using a variety of textures, a mix of natural wood and/or stone finishes or a mix of metals or metallic finishes. Give an outdated fireplace a fresh, contemporary look by painting wood or brick surrounds, chimneys and walls white. Muted or earth tone colors read the same as neutral colors on painted walls. Combine focal points. Mount the TV over the fireplace (by framing in the wall if necessary) or on the wall next to it and arrange furniture to face both. 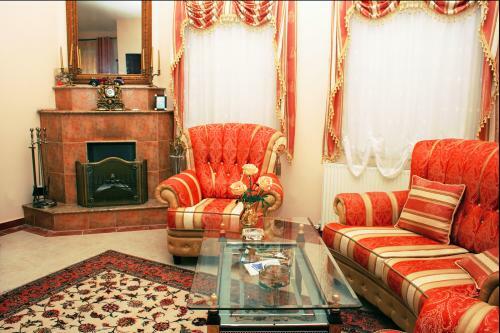 Group sofas and chairs near the fireplace but facing each other, allowing the fireplace to become part of the backdrop. Like the icing on cake or the jewelry to the outfit, decorative accessories add important final touches to corner fireplace designs. Always use a less is more philosophy when adding decorative accessories to a corner fireplace. Too many accents turn into clutter and will detract from the look of any style. Symmetrical displays and objects grouped in even numbers lend a formal look while asymmetrical displays and objects grouped in odd numbers tend to feel more casual. Rotate decorative accessories seasonally to keep your corner fireplace area uncluttered and looking fresh. No matter what type of fireplace you have or want to install, make sure it adheres to local building codes and safety inspections. The most beautifully decorated fireplace won't be as gorgeous if you aren't safe when installing and decorating around it.